Every parent wants his child to be safe and happy, but the dangers surrounding us in our daily lives don't go away and sometimes come from the most unexpected sources – video games. The problem with noticing the symptoms of gaming addiction is that this addiction may not seem like a real issue to a lot of people, because addictions are generally associated with consumption of substances, like drugs or alcohol. Regardless of how we refer to this phenomenon when a person replaces real life experiences with a virtual reality and experiences serious withdrawal when not playing a game, we're talking about addictive behavior. Gaming addiction is quite a recent problem in the world where the availability of entertainment is no longer a problem and is always just a few clicks away. When it comes to children, it can be safely said that they are highly susceptible to the development of gaming addiction. The desire to play games and immerse themselves in a world of fantasies is natural to children, and modern video games make this experience feel incredibly real, thus engaging the child instantaneously. The issue becomes even more urgent these days because children and teenagers can take the games with them to school or any type of social gathering, thus making the problem even more difficult to pinpoint. In most cases the classic image of the gamer sitting in front of his computer without leaving the house for days, will not even apply to addicted adults and children. After all, the smartphones and laptops can be taken with you wherever you go. The addiction to video games has been mentioned in the section of Diagnostic and Statistical Manual of Mental Disorders (DSM-5) edition as a condition requiring further clinical research. The fact that this problem has already been included in this manual says a lot about the severity of this issue. But is this problem as serious as authorities would like us to believe? A whole range of studies were conducted to find out how much children play video games and how many of them are actually showing signs of addiction. A meta-analytic review conducted by J. Barnett Griffiths; M. Coulson; Ferguson, C.J. (2011), has concluded that 3.0% of gamers may exhibit pathological gaming, which can be a sign of mental health problems. A survey conducted by Entertainment Software Association (2007) has come to a conclusion that players of MMORPGs are much more likely to develop addictive behavior rather than those that play other types of games. For example, Dr. Maressa Orzack has estimated that approximately 40% of World of Warcraft (this is a MMORPG game) players were addicted to it. Asian countries were hit the hardest by the plague of game addiction among teens and tweens. According to the results of a survey conducted in 2006, 2.4% of South Koreans (age 9-39) have a game addiction. On the other hand, in the United States a 2007 Harris Interactive poll found that as many as 8.5% of people between the ages of 8 and 18 could be classified as clinically addicted to video games. In 2009 a report of the Centre for Addiction and Mental Health showed that over 10% of children between Grades 7 and 12 had video game problems. Recent advances in mobile technologies have greatly worsened the problem, since now it is possible to play video games practically anywhere you go. This made video game addiction the fastest growing addiction in the world. 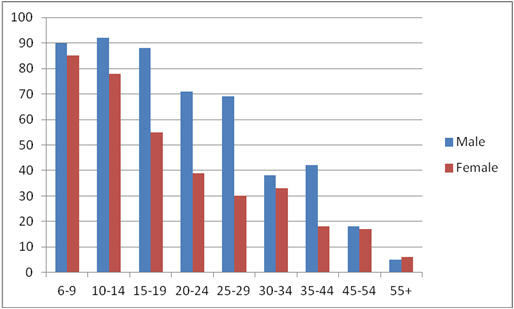 Graph below shows the proportion of the UK citizens who play video games on at least one platform depending on their age group and gender. Information is based on a study conducted by The Daily Telegraph (London), 3 April 2008. Which factors contribute to the development of game addiction? But what are the motives that make some people more prone to video games addiction than others? As we have already mentioned, children are definitely in the group of risk because of lack of the life experience, more impressionable psyche, and tendency to avoid any complications by escaping into the fantasy world. According to the work called "A motivational model of video game engagement" published by the American Psychological Association, the motives underlying a gaming addiction can be different, but all of them are based on the satisfaction of certain psychological needs. It has been proven that the constant deprivation of needs creates a favorable environment for the development of addiction to games where these needs can be compensated to a certain degree. The approach of the scientists is based on the self-determination theory proposed by Deci & Ryan (SDT; Deci & Ryan, 1985; Ryan & Deci, 2000a). Following this theory, players are likely to become addicted to gaming on the basis of the need for autonomy, relatedness, or competence. Simply put, the need for autonomy is characterized by the desire to feel in control, relatedness – to feel included into a social group, and competence – to get the feeling of successfully achieving something. The variety of games available these days provides satisfaction of various needs to a different extent. For instance, a video game as elaborate as World of Warcraft can provide satisfaction of all the mentioned needs. The game creates a sense of the virtual community, unity, and co-dependency, which can be too overwhelming for everyone, let alone children and teenagers. Another major factor that contributes to the development of gaming addiction is the reward system that is inherently present in all the video games you can find. Our brain is wired in such a way, that when we receive a reward for doing a certain action, the information gets programmed into our brain. Afterward, the brain starts to associate the actions with the feeling of gratification that can be received from it. According to the article "The psychology of game addiction" that can be found on Theweek.com, this is exactly the area that gets exploited by video games. In comparison to a real-life situation, when you have to study or work hard to achieve results, you get points and bonuses for something as insignificant as passing a level or killing a monster in a game. How to determine whether your child experiences gaming addiction? There is no universal approach to determining gaming addiction, but there are definitely certain guidelines that can help. First and foremost, it is highly important to pay attention to any behavioral changes. If you suspect that there may be signs of addiction, try talking to your child and in most cases you will be able to tell if there is a problem by the reaction you receive. 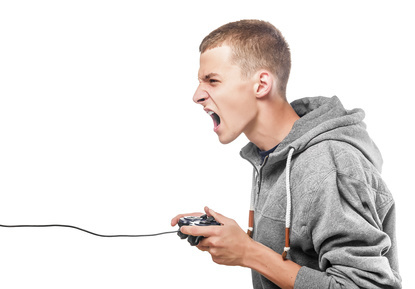 In case you child responds with aggression to any suggestions to limit the time spent playing video games, this may be a sure sign that something is already wrong. The best way to determine the extent to which the issue has developed is by consulting a psychologist experienced in addictive behavior. It should be noted that this list doesn't include every symptom, and they don't always mean that your child suffers from gaming addiction, but it's better to be safe than sorry and recognize the problem early on. What are harmful effects of gaming addiction? Vision problems. Staring at the glowing screen for hours can significantly worsen the vision, especially if vision problems have already been present. Lack of social skills development. It is one of the major problems related to gaming, especially when it comes to children. Kids need to socialize and spend time with other children to learn about the world and society, but gaming addiction can become a great obstacle. Obesity. It's difficult to imagine people playing a video game while running on a treadmill, and most adults and children play games while sitting or lying down. Moreover, snacking instead of eating full meals is a widespread habit among gamers, as it is much easier to eat this way without leaving the computer. The children prone to gaining weight can easily become obese due to such lifestyle. Concentration and education problems. It's hard to focus on the studies when you're anticipating your next video game raid or how you will conquer a castle. The ability to concentrate on the daily tasks reduces significantly due to the gaming addiction. Other physical factors. Backaches, sleep disturbances, migraines, and even a carpal tunnel syndrome can all be found among children and adults who prefer to spend all their time playing games. According to the National Heart, Lung, and Blood Institute, the limit for the "screen time" should be two hours a day or less, which includes TVs and computers. 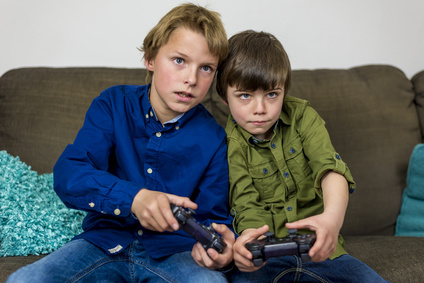 Dealing with the gaming addiction of your child can be difficult, but you need to remain firm and not fall for begging if the situation is getting out of control. It is essential to talk with your child, notice any changes in the behavior and consult a specialist if nothing seems to help. Moreover, even when you successfully overcome the addiction, it is essential not to let the situation spiral out of control ever again. It is when preventive tools become incredibly useful. Similar to any problem in life, it is much easier and much less stressful to prevent a gaming addiction than deal with the consequences. Fortunately, the progress of technologies is not only limited to the development of video games and other sources of online entertainment. There are a number of serious apps that can help the parents prevent the development of gaming addiction, as well as regulate this condition if it has already started to become evident. With the help of Teentor, you don't have just to be a spectator, but you can actively put restrictions on the use of certain games, apps, and websites. What is great about Teentor is that you can either ban the game completely or limit its use to a certain time, for instance no more than 30 minutes a day or only from 9 am to 12 am. You can select the age of your child in the app, and it will automatically choose which content is not appropriate for a child or this age and block the access to such resources. Currently, this computer and cell phone tracking software successfully operates on Android, Windows, and it is under development for Mac OS. In the digital world, these computer and cell phone spyware systems are more of the necessity rather than a luxury in protection of your child.